Frestonian Gallery is delighted to present the first major retrospective exhibition of the work of Sam Herman, to celebrate the launch of Lund Humphries new monograph on the artist. Sam Herman’s magical creations in glass are the tangible product of a creative spirit, a philosophy, and a crusading energy that place him at the very centre of the story of contemporary studio glass. Sam Herman (b.1936) is a glass artist, painter and sculptor. A true modernist, Herman stands at the very centre of the development of the International Studio Glass Movement. He was not only present for the birth of the Movement in the United States, but he is its founding father in Great Britain and Australia. His influence is seminal - he inspired a generation of glass artists, developed revolutionary techniques and following his lead, colours in blown glass would become more textured and fluid. Herman has exhibited extensively throughout the world and his work is held in numerous public and private collections including, amongst many others, the Victoria & Albert Museum, London; Metropolitan Museum of Art, New York; Smithsonian Institution, Washington DC; Art Institute of Chicago; Fitzwilliam Museum, Cambridge and the National Gallery of Victoria, Melbourne. The Studio Glass Movement revolutionised the understanding of glass as an art form. Up until the 1960s ‘glass art' was based on the 'designer and maker' principle. A glass 'artist' would produce a 'design' and then hand it on to a craftsman glassblower who would 'make' the final work in an industrial furnace. In 1962, in Wisconsin, Professor Harvey Littleton and Dominic Labino set out to break with this traditional model. They built a small tank-furnace, experimented with glass that would melt at lower temperatures and began developing new tools that would make it possible for the artist to have direct access to the material, ultimately allowing designer and maker to become one. Henceforth, the Studio Glass Movement was born. That very same year, Herman enrolled at the University of Wisconsin. Initially, Herman's Major was in sculpture with a Minor in ceramics, but during enrolment he met some students who were there to enrol on Harvey Littleton's new glass course. This exciting new programme immediately caught Herman’s attention and he managed to persuade Littleton to take him on too. These were the early experimental and pioneering days of Studio Glass that would change glass art forevermore. British Studio Glass. Herman would remain at the RCA until 1974 as the Tutor in Charge of the Glass and Ceramics Department. In 1969, Herman set up the celebrated Glasshouse in Covent Garden. Herman conceived it as ‘a workshop that would act as a halfway house between college and the real world, supporting artists in creating a life in glass away from industry’. For the next thirty years the Glasshouse became a centre point for British Studio Glass. In the words of the art historian Dan Klein ‘what is remarkable is that almost all who worked at the Glasshouse have in one way or another made a significant contribution to the world of glass, and each one in a very personal way’. In 1971, The Victoria & Albert Museum held a highly acclaimed exhibition of Herman's work, the first of its kind by a contemporary glass artist. At around the same time Herman agreed to produce a line of production work for the celebrated Belgian glass manufacturer Val St Lambert. In 1974, Herman was invited by the South Australian Government to set up the glass workshop at the Jam Factory in Adelaide, thereby bringing the Studio Glass Movement to their shores. Herman eventually returned to the UK in 1979 to set up a studio in Lots Road, London. In 1983, Herman became an Honorary Fellow of the Royal College of Art. In 1984, Herman moved to the west coast of Mallorca, creating a home and studio in the Tramuntana Mountains high up above the Mediterranean Sea. Inspired by the awesome landscape and the atmosphere of this new territory, Herman took the radical decision to re-focus his immense talents on painting and sculpture, the path he had initially set out on before his meeting with Littleton. Since moving his studio to Mallorca, Herman has only occasionally been persuaded to return to the furnace. 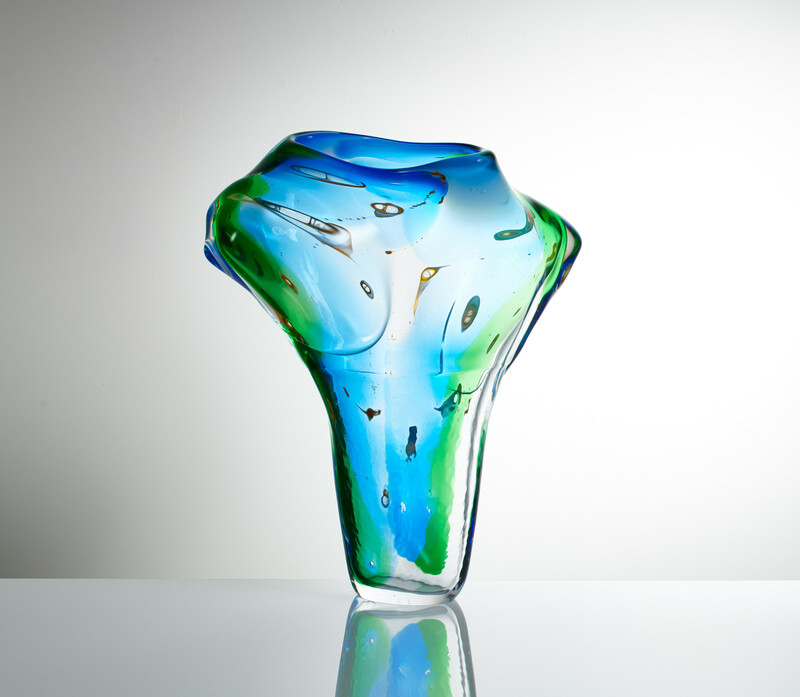 One such occasion was in 2012, when Herman agreed to mark the 50th anniversary of the birth of the Studio Glass Movement by producing a limited edition of works at Peter Layton's London Glassblowing, and more recently Herman has produced small series of works at Colin Hawkins' studio in Cirencester. Herman's primitive painting style and sculpture work have been a revelation to his audience. Much of it is influenced by his unique understanding of the nature of glass and colour, it consequently delights in adding a new dimension to his oeuvre.